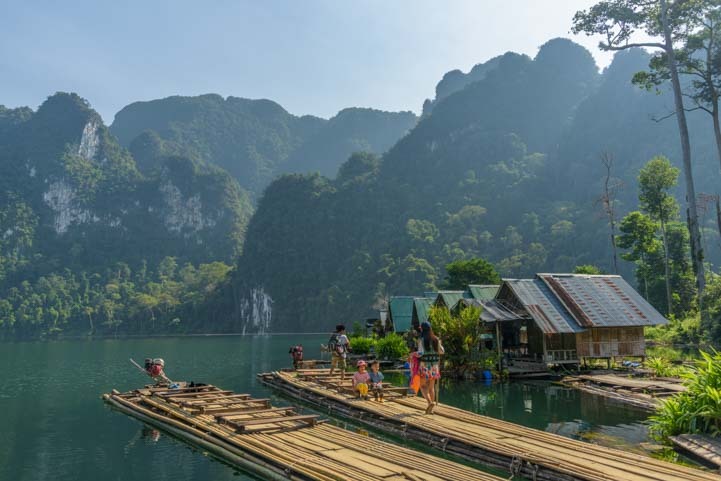 January 2017 – During our stay at Greenery Panvaree floating raft house resort in Khao Sok National Park, we had an absolute ball with our cameras, taking endless photos of this incredibly scenic little fairy tale hideaway on Cheow Lan Lake in Thailand. Kayaks are available for guests to use any time for free, and I took off to explore the coves nearby. 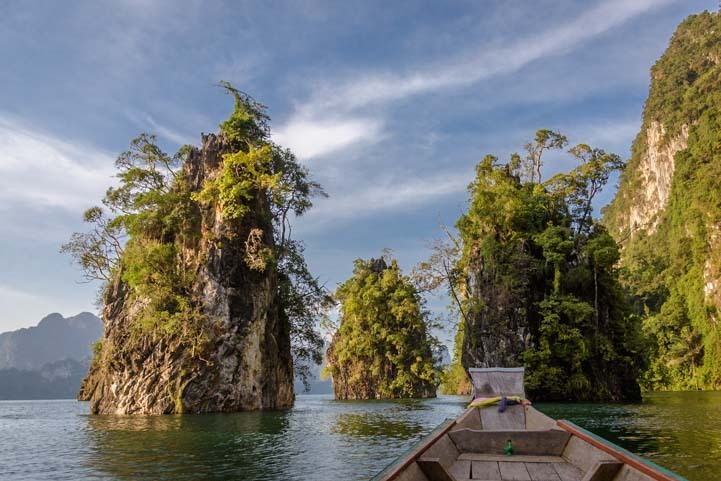 As I pulled into one small cove after another and drifted along the shore, I was amazed that each cove had a song of its own as one resident bird or another sang its heart out deep in the trees that clung to the steep slopes. 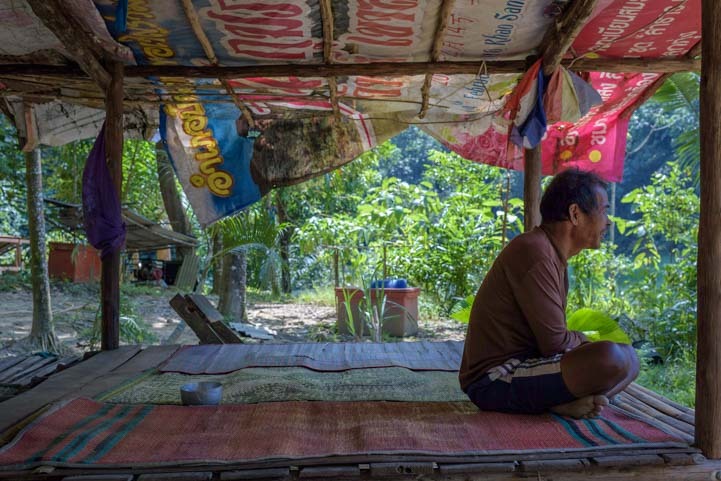 The construction of Ratchaprapha Dam to generate electricity for all of southern Thailand ended up displacing many families that lived along the river as the waters rose and Cheow Lan Lake formed. So, there is a unique tradition at Greenery Panvaree to honor the people whose lives were so terribly disrupted and to say thanks to river goddess and to the jungle for this beautiful and precious place. Every night Greenery Panvaree combines their personal tribute to Cheow Lan Lake’s origins with a small reenactment of a traditional annual Thai ceremony called Loy Krathong (ลอยกระทง) that takes place nationwide on the full moon of the twelfth month in the Thai calendar (usually in November) . After dark, all of us guests at The Greenery section of floating raft houses gathered on the main dock, and we were each given a candle embedded into a small loaf made from bread flour. 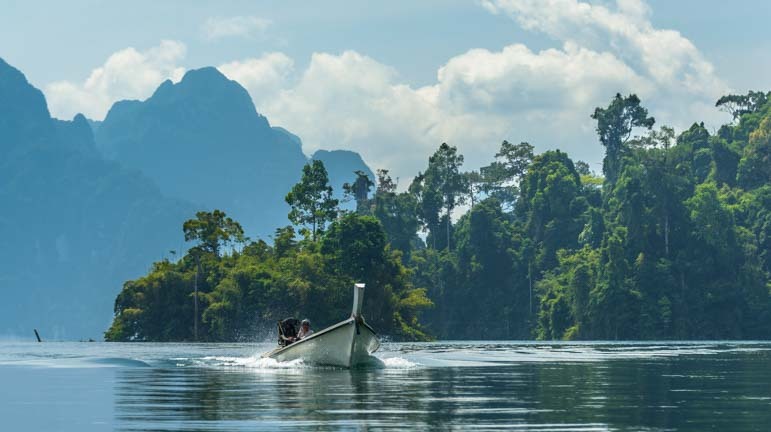 We climbed into a longtail boat for a short ride to the next cove and soon found ourselves drifting silently on the silky water under a canopy of stars. 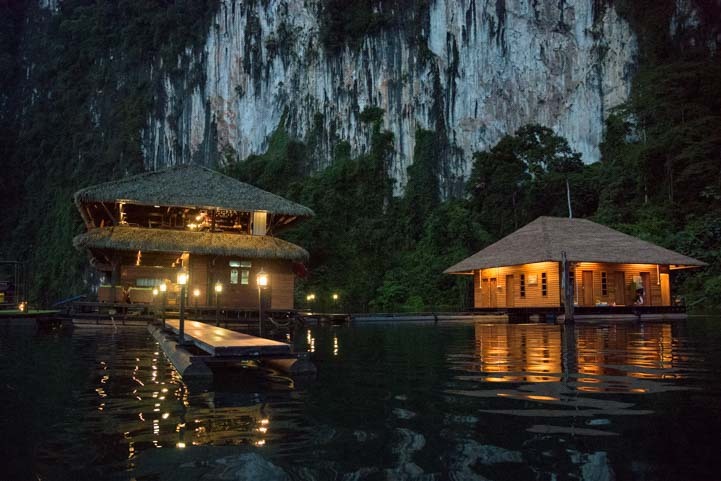 After dark, guests took a longtail boat ride to honor the spirit and history of Cheow Lan Lake. As the boat rocked gently in the waves I looked up and saw Orion sparkling in the sky. The dark night air embraced us as our hostess, Yohke, told us a moving story that took place in this exact spot about 50 years ago when it was the edge of a river rather than the surface of a huge wide lake. A young man named Jong Dong had lived and worked on the river, and he was deeply in love with his beautiful young bride-to-be, Kaew. Just days before their wedding, he had an accident with his boat and he died. His young fiancée was so overcome with grief that a few days later she died from a broken heart. A spirit house, or shrine, stands on the shore of the lake near the place where he died and is dedicated to the memory of “Grandfather Jong Dong” and “Grandmother Kaew.” We couldn’t see the spirit house in the dark, but we were all very touched as Yohke told this story, first in Thai for the Thai guests and then in English. 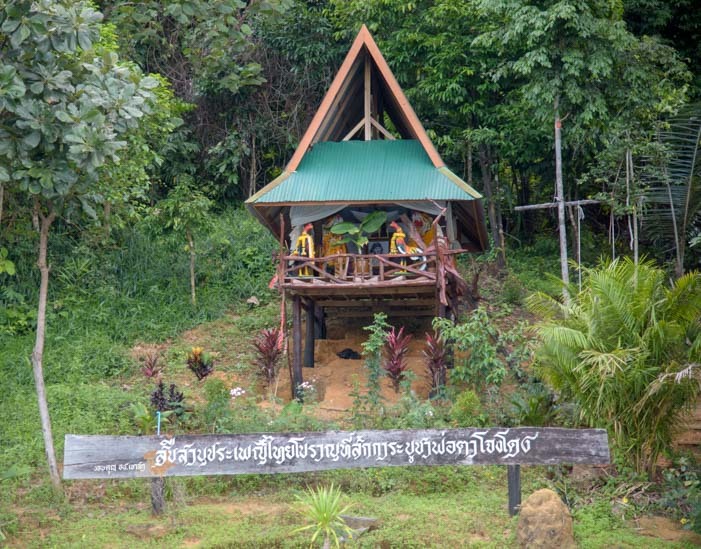 The spirit house for Grandfather Jong Dong and Grandmother Kaew — in daytime. As night’s gentle breezes caressed us, we each held out our candles and Yohke lit them. Then we each silently made a wish and thanked the goddess of the river and the goddess of the rainforest for the beauty of this unique spot. One by one, we reached over the side of the boat and placed our candles in the water. The little bread loaves that carried the flickering candles slowly floated away. This is the essence of the Loy Krathong celebration in which the light of the candle venerates Buddha and the water symbolizes the cleansing away of one’s cares and frustrations. To keep the National Park’s lake as “green” as possibly, by morning the bread loaves would disintegrate and become food for the fish. 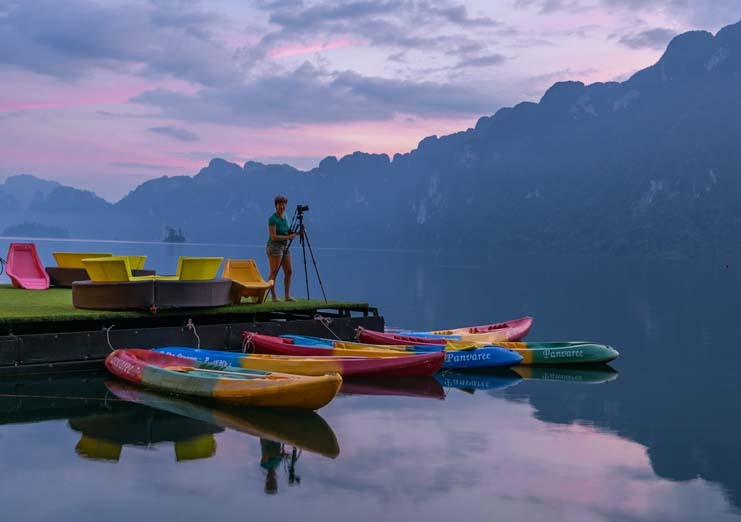 Cheow Lan Lake at dawn. 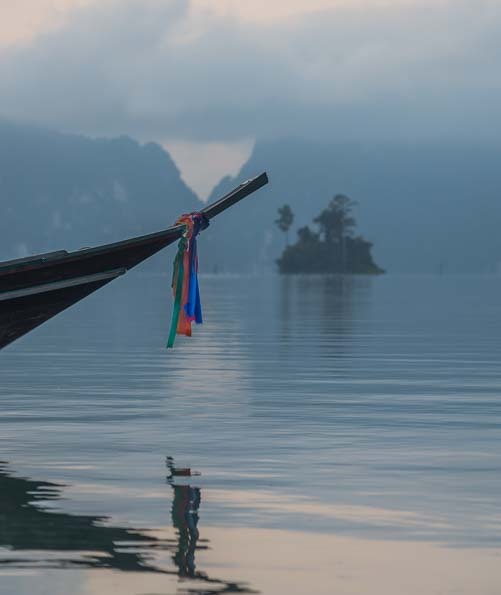 The next morning we were up at the crack of dawn for another longtail boat excursion out onto Cheow Lan Lake. 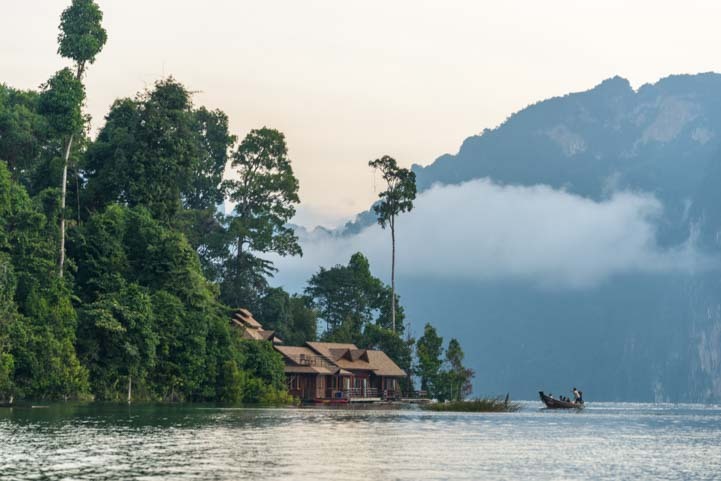 As we drove out onto the lake we learned that the name “Panvaree” is a fun play on words with “Pan” meaning “1,000” in Thai and “Varee” being the name of the owner’s mother as well as the word “river” in Thai. Along with our companion Greenery Panvaree guests (a local Thai family enjoying a family reunion), we took an early morning longtail boat ride with our hostess Yohke (left). Mist and fog clung to the mountainsides as we cruised along. 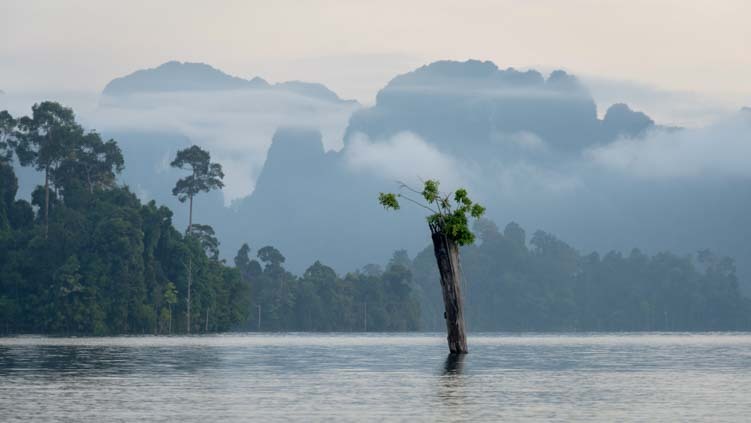 In many places the tallest of the trees that once lined the river’s edge stuck up above the surface of the water. And everywhere around us the jungle slowly awoke and the sounds of exotic birds and other creatures filled the air. Eventually our driver stopped the boat and let us drift right up to the shore in one cove. He pointed up at a tree and we all gazed up in wonder as we heard something very big moving around in the tree. Tree limbs shook and leaves rustled, and then we saw two huge Great Hornbills high above us. These are hefty birds that are about the size of a pelican, and they made guttural noises as they moved about on the branches. They seemed to be ignoring us in our longtail boat just below them. Suddenly, one took off into the sky with a majestic sweep of his huge wings. Then the other flew away too. Wow. 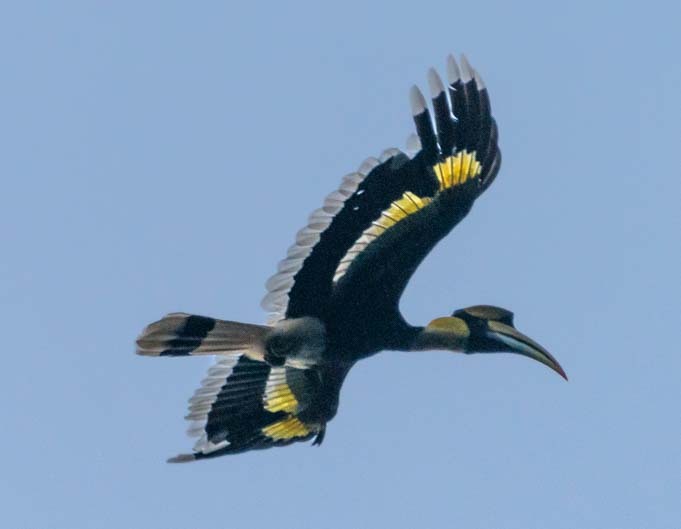 A Great Hornbill takes flight above us… Magnificent! When Yohke had told us before the boat ride that we might see hornbills, I had no idea what she was talking about. But when we returned to our room and I into our bathroom, I suddenly recognized the image that was hand painted on the lovely ceramic sink basin! 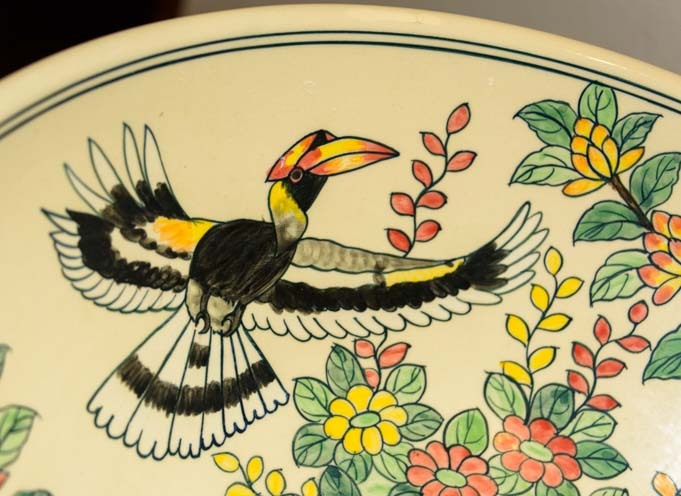 The handmade sink basin in our room was decorated with images of Great Hornbills – Cool! It was special touches like these that made Greenery Panvaree floating raft houses such a unique spot to visit. We learned that the great hornbills hang around in the jungle by the lake quite a bit, and they are a mascot for Greenery Panvaree. 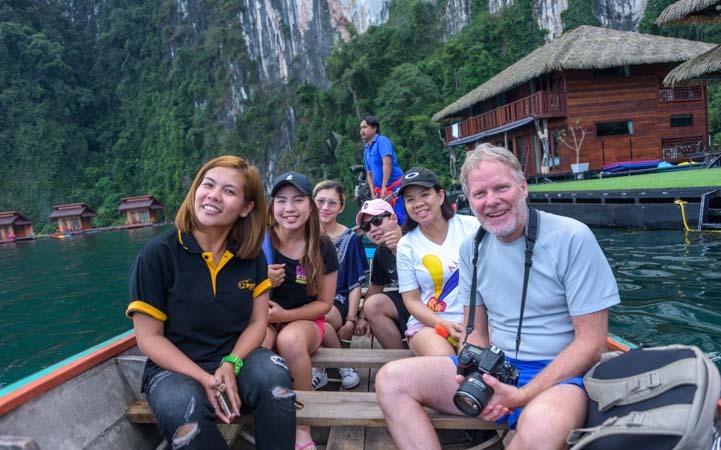 We then had a traditional Thai lunch in the main raft house restaurant, and Mark got a wonderful photo of the pretty young women who had been taking care of us during our stay. The staff at Greenery Panvaree took great care of us. 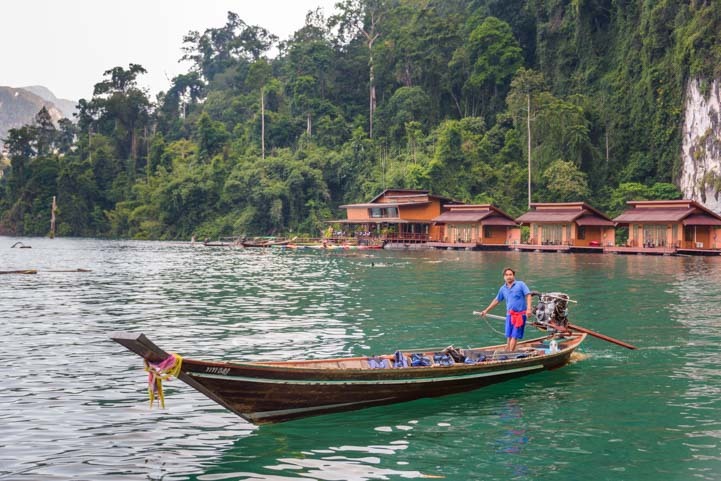 Then our captain brought our longtail boat around to the dock once again for an afternoon excursion on the lake. 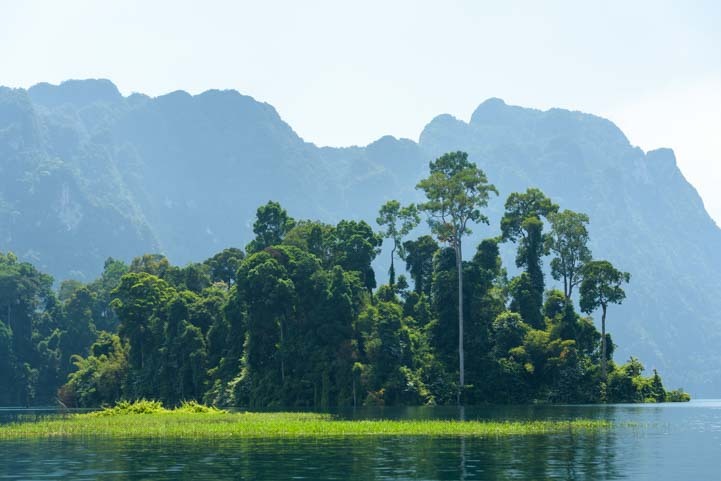 Again, the exotic scenery of towering limestone cliffs in the background with lush jungle vegetation in the foreground caught our imagination as we slipped by on the lake. 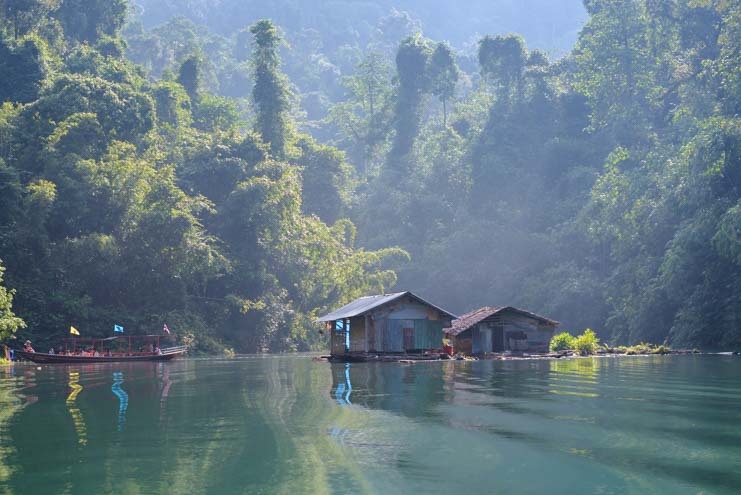 Eventually we pulled into a cove where the mist of the rainforest moisture hung heavily in the air. A small settlement emerges on the misty shore. 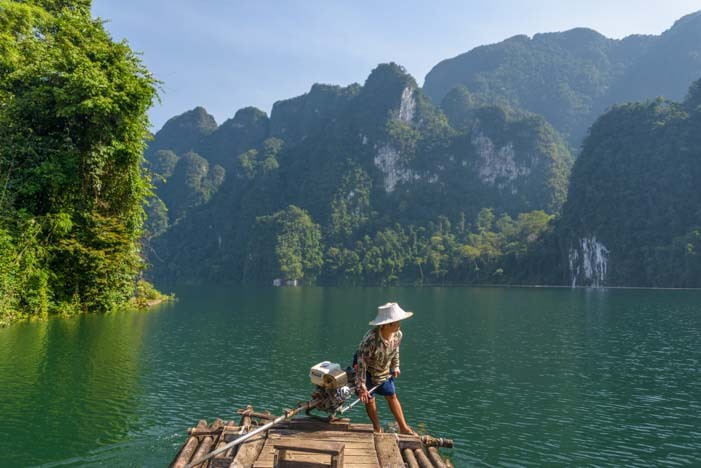 We got off the longtail boat and began a trek through the jungle to another lake. The path was wide and it was an easy walk despite the truly sultry heat that enveloped us. Suddenly, someone up ahead pointed into a tree. As we approached we saw something dark and then caught a glimpse of a pair of eyes peering out through the leaves. 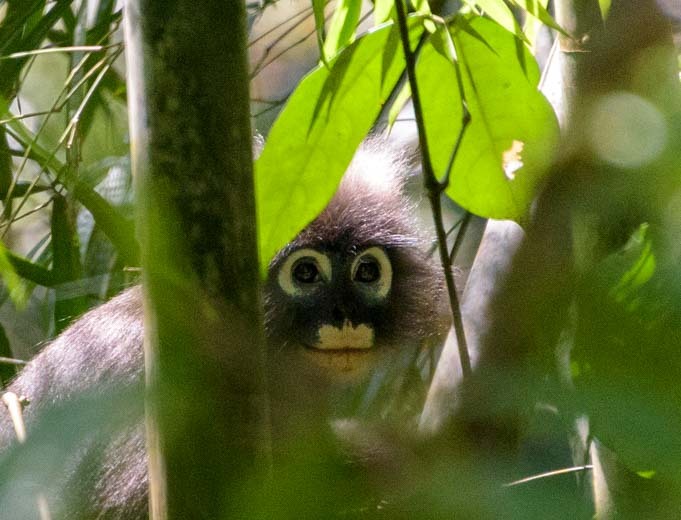 A Dusky Leaf Monkey peaks out at us. 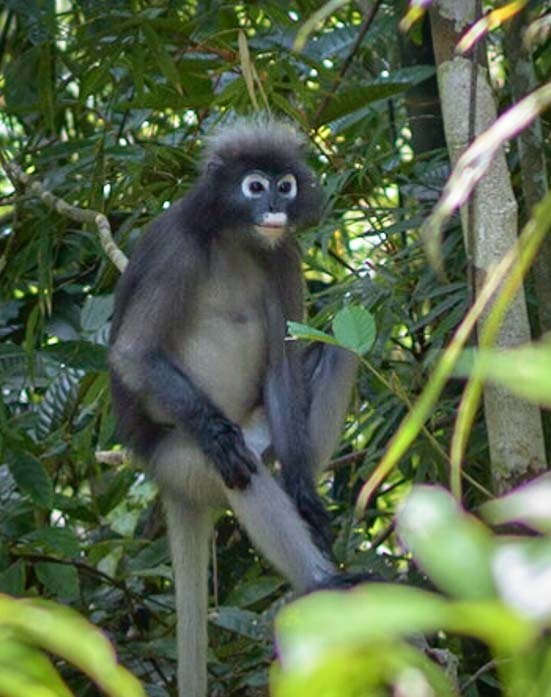 It was a dusky leaf monkey, and he was as happy as could be as he quietly sat in the shade of the leaves. What a cutie pie. Look at that tail! 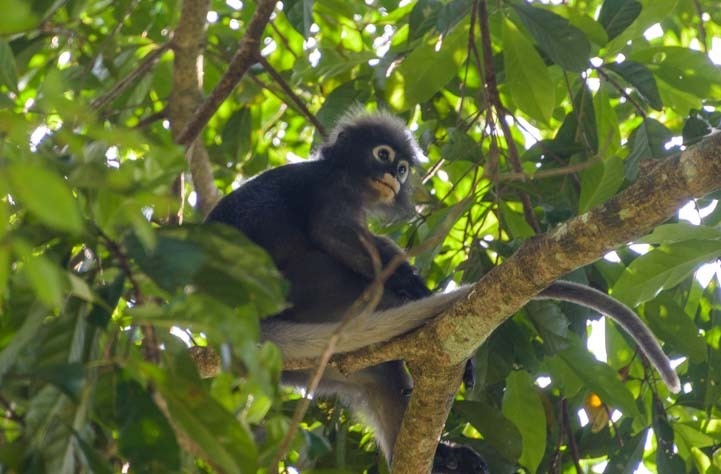 We had seen longtail monkeys in Kanchanaburi when we visited the Lawa Cave, but this was a monkey of a different color and totally different personality. What wonderful good fortune that he was in the trees watching our parade of humans go by! The path opened up and some buildings appeared, and off to one side we saw a pineapple growing. 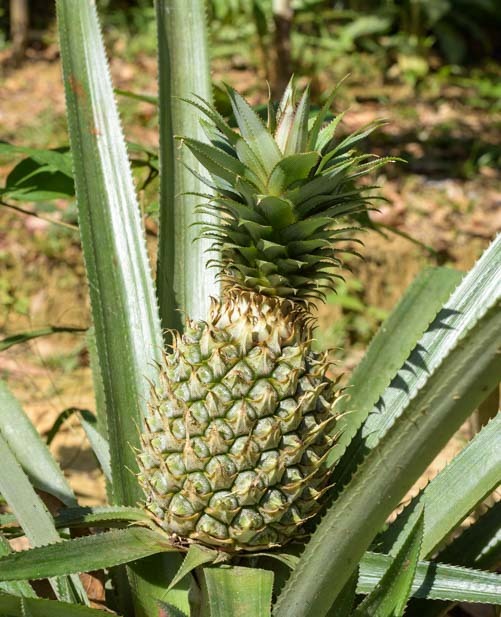 Down on the ground a pineapple was ready to pick! 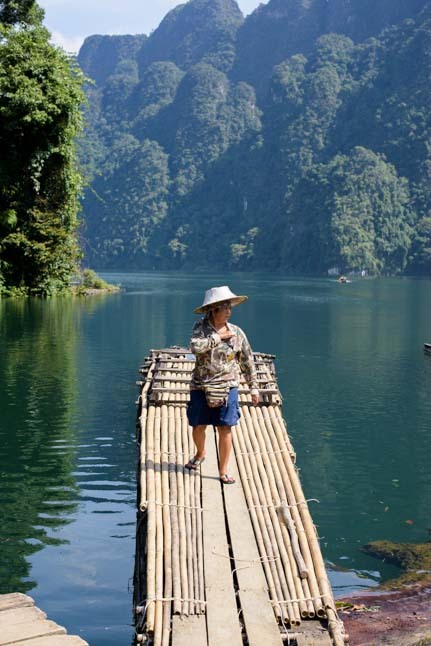 Then we saw the lake we had been hiking to, complete with long bamboo rafts waiting for us on the shore. 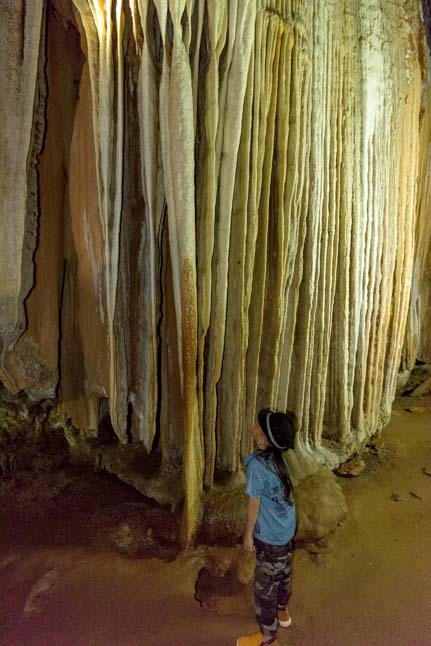 Long rafts made of bamboo logs were waiting to take tourists out to Coral Cave (Pakarang Cave). These are very cool rafts that are 100% bamboo. Because the bamboo logs have sealed hollow chambers, they are extremely buoyant and easily support lots of people sitting on them. We all climbed aboard and our raft pilot maneuvered the engine to get us turned around and headed onto the lake. Our pilot turned the bamboo raft around to head out on the lake. We zipped across the small lake and were delivered to a very short hiking trail to Coral Cave (Pakarang Cave). The trail was a little slippery in one spot because of the moisture of the rainforest and the cave, but there were railings to help us keep our balance. Once inside, we were greeted by fabulous stalactite and stalagmite formations. Some were very long fins. 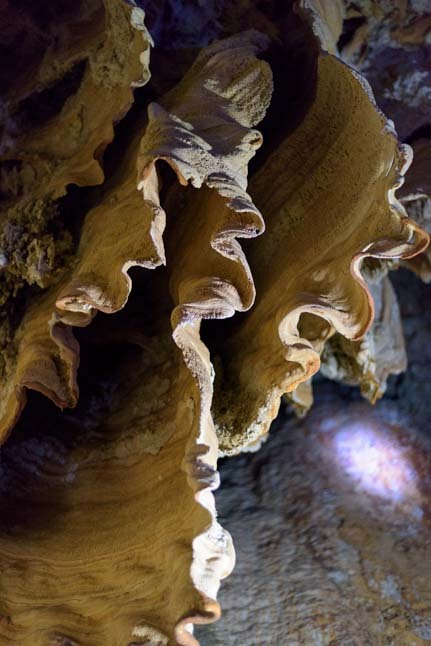 Coral Cave was filled with beautiful formations. Others were little crystaline formations and still others were like mammoth fall leaves or giant clams. 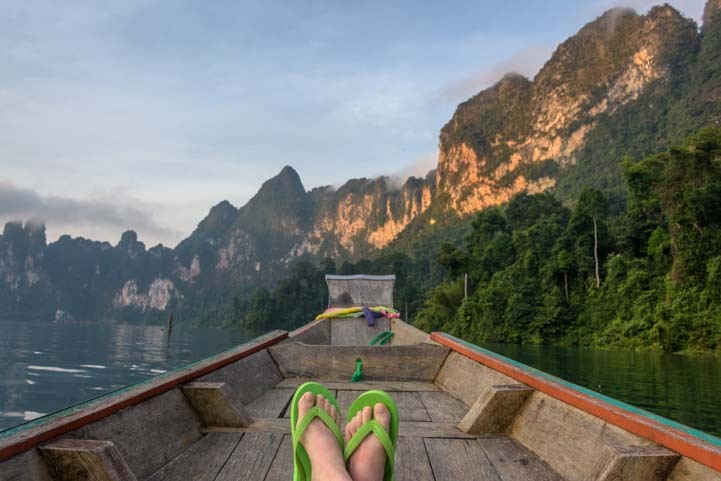 After a refreshingly cool meander through the cave, we hopped back on the bamboo raft and hiked back through the jungle to our longtail boat which was waiting for us on Cheow Lan Lake. 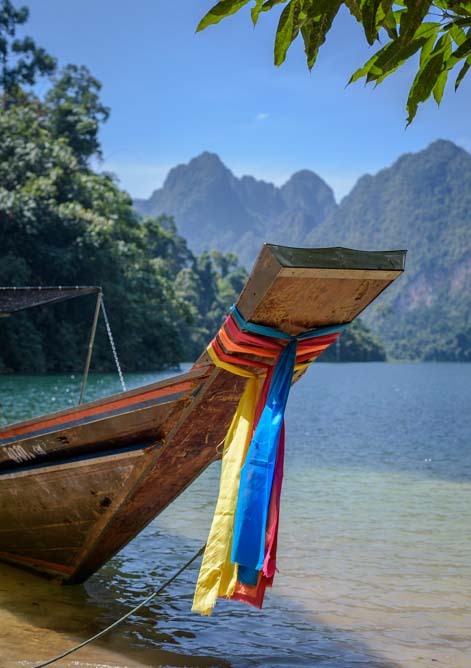 Our longtail boat was waiting for us! 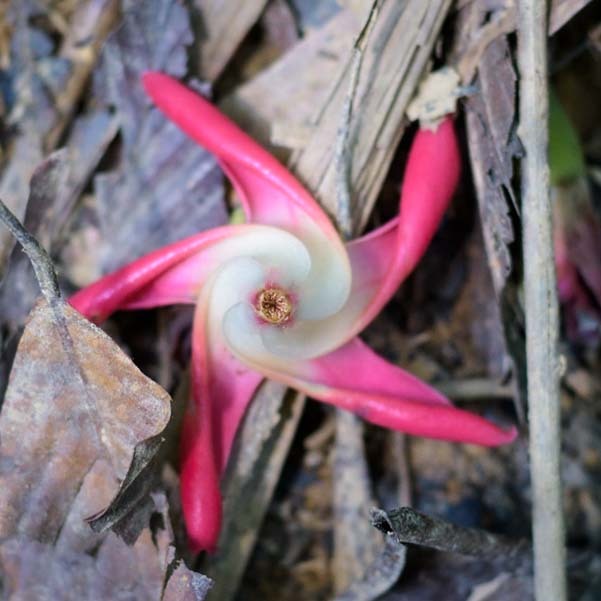 Along with pretty flowers growing here and there, Mark spotted a wonderful pinwheel shaped dried flower on the ground. There were a few shops and resting areas under simple bamboo shade ramadas near the boat and we roamed around a bit. 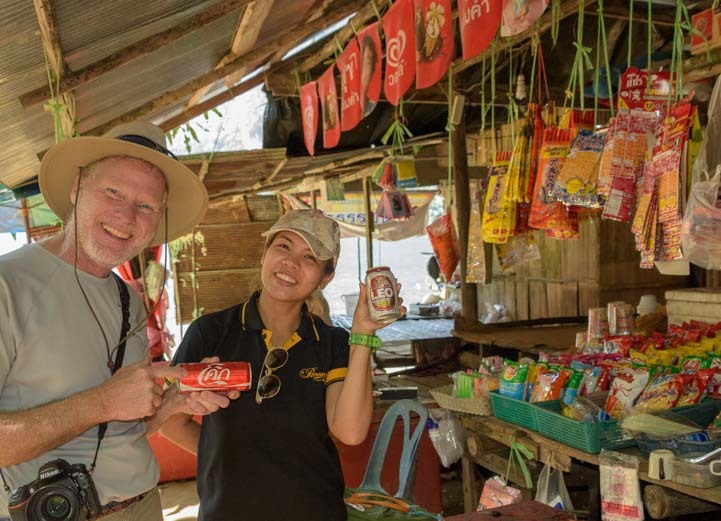 We’d been drinking water like mad, but what fun it was to get a Coke with the beautiful Thai script letters on the side of the can! As Yohke explained to me later, Thai people love to have organized activities as part of their vacations, and after a brief few hours of relaxing back at our delightful floating bungalow at Greenery Panvaree, we set out on one last longtail boating excursion on Cheow Lan Lake. 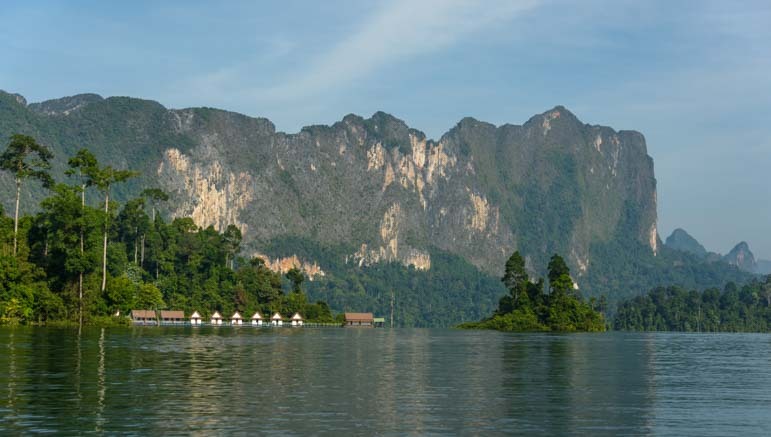 Mountain views on Cheow Lan Lake. The sun was setting and it cast a wonderful golden glow across the tall limestone rock formations on the water’s edge. 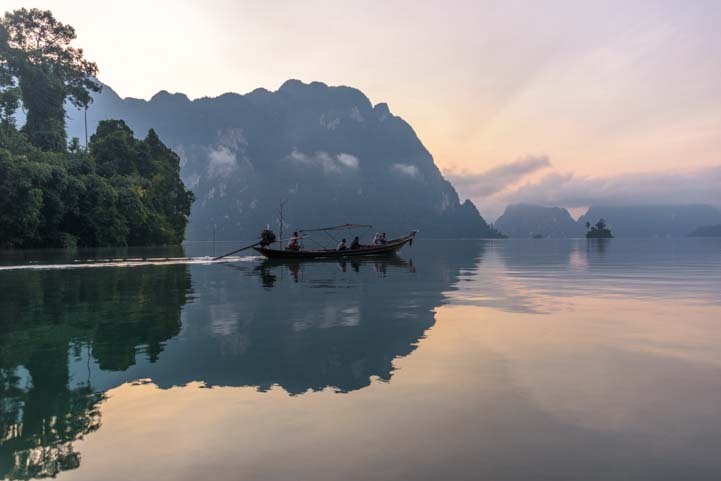 Our captain took us to Little Ha Long Bay, which is named for the much more famous Ha Long Bay in Vietnam because of the resemblance in the rock formations. This is a favorite spot for selfies, and we all took turns getting our photos taken with the rocks behind us. What a hoot! 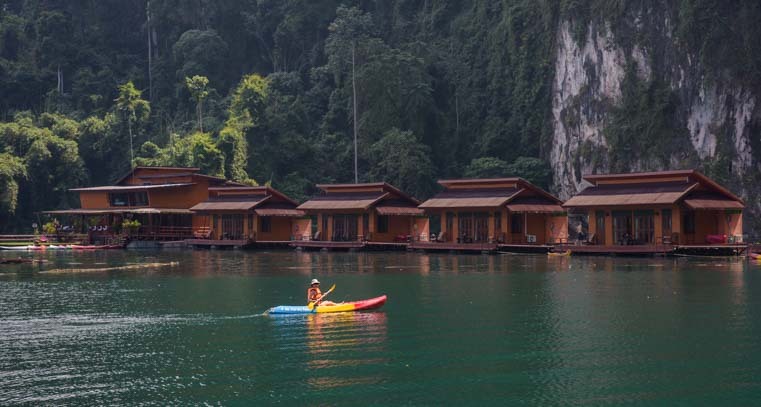 Our stay at Greenery Panvaree floating raft house will always be a treasured memory. 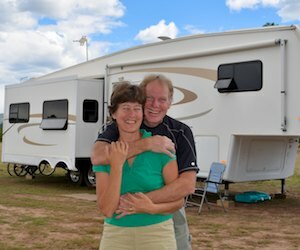 It is an unusual destination that few foreign tourists know about, and we feel blessed that we found this jewel on the internet prior to our trip and arranged to spend a few days there. 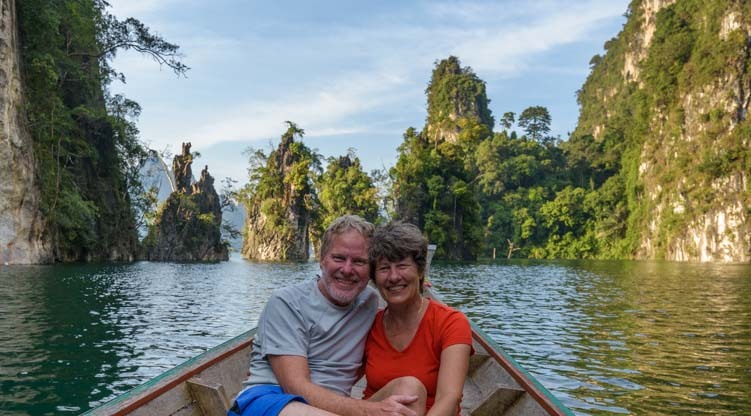 What a lovely trip through idyllic lakes in those fairy-tale mountain settings – love the strange formations in the caves and the surprising wild life. A memorable post…. It was a very special experience in a truly exotic place!! Looks fantastic! That water looks really clean and cool! Any creatures in those waters keeping people from swimming there? Swimming is a favorite pastime here! There are lots of fish, but nothing that bites.